Stylish wrap skirt outfits. The wrap skirt was first introduced in the late 1960’s when it became very popular among the lasses. The fashion went on till the early 1970’s when it was still roaming in the hearts of people. Today, the vintage style is again in trend. Back then wrap skirts mostly had a length that reached the ankles or lower. In this era, though, we see wrap skirts of different shapes, styles and sizes. 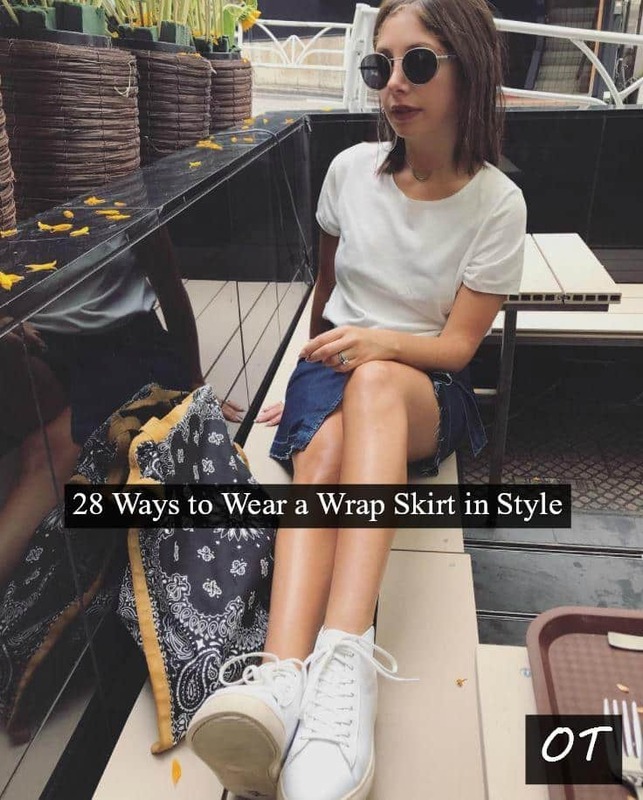 You can also make a wrap skirt at home since it is so easy to make. This way, you’ll get exactly what you want in it. A wrap skirt is worn around the waist and secured through a belt or by tying. The best thing about wrap skirts is that they don’t just look attractive but they are also a comfy fit. Usually, they can be adjusted on different waist and hip sizes. Back in the 1900’s they were made of batiste, a soft cotton fabric. These days, they are made of various materials even denim. If you don’t already have a wrap skirt in your closet, it’s about time you include it. Here are ways you can stylishly wear a wrap skirt. Get a wrap skirt that has some eye-catchy detailing. Like a buckle or strings. A wrap skirt attracts attention to your legs. Be sure to sport top-end footwear. Like pencil skirts, wrap skirts also make for chic and sober office wear. You can wear a wrap skirt with a belt to your workplace. For the upper, wear a button down shirt. Tie your hair atop your head and make a fashion statement. Here are 20 Best Business Casual Shoes for Women. You can choose a modest way of sporting the wrap skirt as well. Wear a long wrap skirt with your outfit and outshine everyone! Spending the day with friends? Wear a wrap skirt! Go for the fun look and wear a light top with a bright wrap skirt. Add in a few cool accessories and you are good to go. Do check out these awesome Girls Night Out Outfits. An off-the-shoulder black pleated top with a long wrap skirt that has a slit would make for the perfect party wear. Try the look, you are bound to see heads turn your way. Attending an event? Keep the style graceful. A long silk wrap skirt with an elegant light shaded top would make you stand out of the crowd. Here are 18 Summer Wedding Dresses that you can try this year. Awaken your inner fashionista and take your style up another notch. For the classy look, wear a long slited and pleated wrap skirt with a fitted and full sleeved high-neck top. Wear heels that make the look even more sassy. You are sure to catch loads of appreciative glimpses. You are wrong if you think that wrap skirts are just limited to summer time. The incredible skirt style can also be sported in winters with the right winter wear. A wrap skirt of a thick material would do. Incorporate a wrap skirt in your everyday wear and look stylish. Here are the cutest Yellow Skirt Outfits. Boho prints or plain style looks super fabulous. Here are 18 Ways to Dress Like Boho Chic. Flowery prints make for the best choice in summers. Try a floral printed wrap skirt with a crop top for ultimate style. For the glamorous look, wear an all white outfit. A long chiffon wrap skirt with a plain top is sure to make you look like a Greek goddess. Check out these 25 Ways to Wear Cobalt Blue Skirt. Serve your wanderlust, add more fun to your travel diaries and sprinkle some sparkle in your pictures by wearing out of ordinary, awesome outfits. A lace crop top with a bohemian printed wrap skirt is the perfect example of a gorgeous attire that can make your day. For the girly look, combine baby pink, sky blue and white. White graphic top, sky blue wrap skirt with a baby pink lip shade and you’ll look wow. Throw on a hat, hoop earrings and other delicate but fun accessories for boosting your style. A floating, dyed, long wrap skirt with a pleated, off-the-shoulder white top is sure to make you look like a princess. Check out these 19 Ideas How to Wear Gypsy Skirts. Don’t let anyone deter you from following the fashion mantra. Don’t let your waist size determine what you should and should not wear because when you sport something stylishly and pull it off with sass, you can hardly ever go wrong. A dual colored outfit that makes you look vibrant? No better color choice than white and yellow. Sport a yellow wrap skirt with a white top to look like a woman who knows her fashion. Keep the look chill in a jean wrap skirt and plain white tee. Maroon lipstick plus white sneakers and ta’da! You look flawless. Skip the traditional jeans and t-shirt for a different look. If you think you are too old for mini skirts or simply because your style is elegant, wear a long, light fabric’s wrap skirt with a tee.